Quartzite and marble can appear at times like twins of the natural stone world. Both marble and quartzite are designated as a non-foliated metamorphic rock, as opposed to foliated stones, like slate, which has a layered appearance. The stone colors of both—marble and quartzite—available to designers and homeowners brought forward by the natural stone industry can be similar as well. However, a closer look at a marble slab compared to a quartzite slab reveals their unique qualities. It is not as much an illusion, then one of Mother Nature’s bend on a classic. Marble is formed when limestone is subjected to high pressure and heat. The resulting recrystallization creates marble out of the limestone. (Remember, marble is a limestone, but limestone is not a marble.) These crystals of calcite, one of the marble’s primary minerals, give marble its beauty. Like all limestones, however, because of the high levels of calcite, marble is susceptible to damage by acids found in many foods (lemons), liquids (wine) and cleaning products, including vinegar. Changing weather patterns can also effect marble. That’s why you see so many centuries-old gravestones fading in cemeteries. Nonetheless, marble is a strong stone, can be polished to perfection and has been used for centuries for structures and monuments. On the other hand, quartzite is formed by the recrystallization of sandstone under high pressure and heat, which creates quartz. Most quartzite contains 90 percent quartz, one of the most common minerals on Earth. Think of all of the world’s beaches and deserts—the main component in almost all of that sand is quartz. Both natural stones are excellent choices for any home or business, and if cared for on a regular basis, will bring a lifetime of happiness. Products like Daily Cleaner and Superior Zero Stone Sealer available at Mr. Stone are ideal for marble and quartzite, but more on that later. 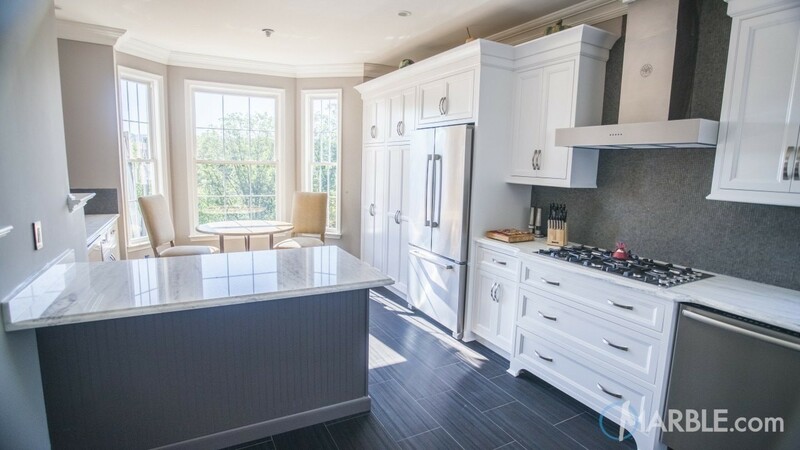 Today, marble counters can be found in homes and businesses throughout the world. The popular Calacatta Gold Marble from Carrara, Italy, and its displays of illuminating whites and bold, striking veins can be employed as kitchen countertops, bathroom vanities and fireplace surrounds. Statuario Marble is also gaining a strong following, offering a gray and gold, bold veiny look on a bed of white. As noted, before installing marble counters be sure that the area—kitchen or bath—can be safeguarded from the hazards of etching by acidic foods, and hair and bath products. But don’t be too afraid. In many instances, products such as Oil Stain Remover can remove ugly etching from marble counters and vanity tops, including the aforementioned Statuario Marble and Calacatta Marble. Although most of us associate marble as white in color, slabs of this beautiful natural stone can be found in variations of green, amber, rose, tannish and gray, thanks again to Mother Nature. If the key carbonate materials in marble—which are mainly calcite and dolomite—are pure, you get impeccable white marble. When other minerals get into the mix, veins and color shades are the end product. Quartzite’s durability and low maintenance have elevated the natural stone to sweetheart status amongst homeowners, especially those who are looking for either an alternative to the ubiquitous granite or a stand-in for marble in a busy kitchen or bathroom. Its smooth and glassy appearance can mimic many marbles. Quartzite is not limited to shades of white. The stone colors range from Dark Brown to light brown, blue, green, pink, and even purple. All these colors, however, have remarkable patterns. Stone colors aside, the major advantage of employing quartzite countertops is the absence of calcite, meaning these slabs will not etch like marble. 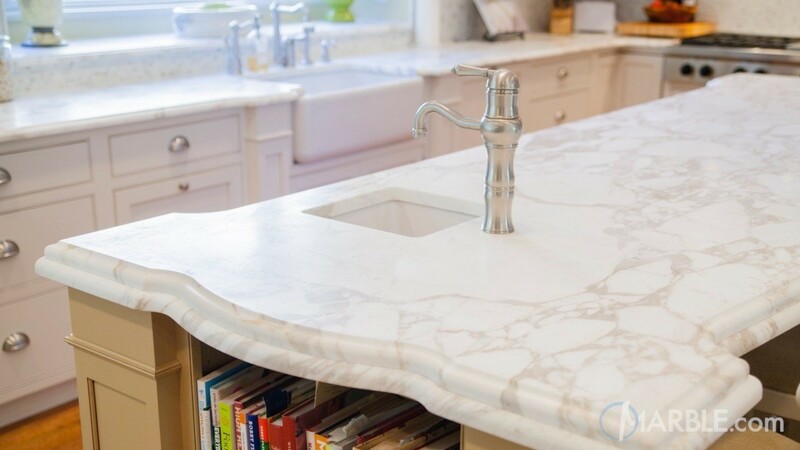 Holders of kitchen countertops designed with quartzite will not have to fret every time juice, wine or lemon come in contact with their precious natural stone. To help repel moisture, staining, and etching, sealing is advised for both quartzite countertops and marble counters. Quartzite should be sealed twice a year. Marble counters should be sealed up to four times per year because it is softer and more porous than quartzite. Marble and quartzite are both beautiful stones with different and similar qualities. Depending on your project and the application, one stone may be more ideal for you than the other. Do some research and visit your nearest Marble.com slab yard before making a decision. Either stone you choose, you will enjoy its beauty for many years to come.